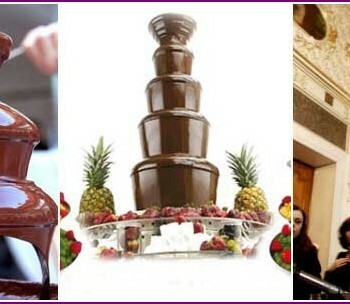 A few years ago on the domestic weddingsThey began to appear candy bars - separate tables with sweet treats for guests. Many young couples quickly picked up a new idea, supplementing and modifying it. Who wedding events can be found bars, not only sweet, but also cheese, cocktail, lemonade. It is interesting to learn about the tea bar - a cozy place where guests can relax and talk in a relaxed atmosphere over a cup of flavored beverage. The original table for tea parties create the unique atmosphere of celebration and will be enjoyed by the audience. 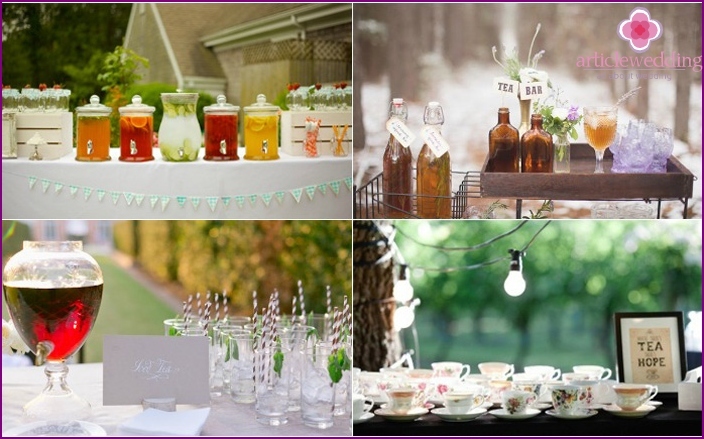 For a wedding in any style will be appropriate tea bar? 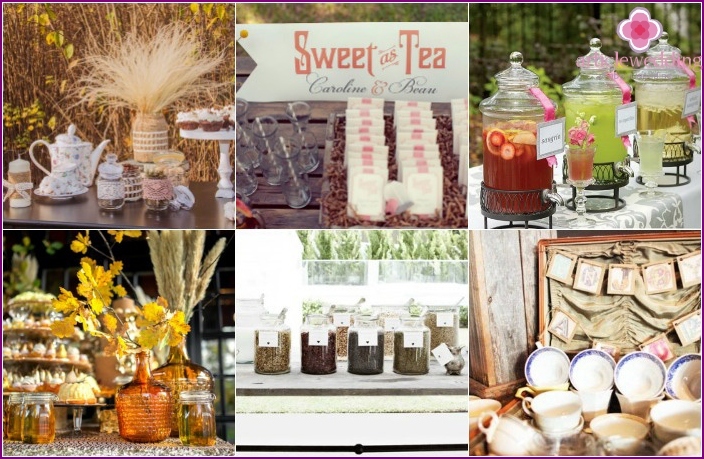 Tea bar depending on the design stylesuitable for almost any wedding, especially good this element appears at festivals in the rustic style of Provence, Shabby-chic. A cozy table for tea parties will be a wonderful addition to the eco-wedding, and its English version will fit perfectly in a more formal and solemn event. In addition, the tea bar is great for a Russian-style celebration - original features along with delicious drinks create the perfect mood of the guests, atmospheric area is a great place for a photo shoot. The original table with a variety of teas will beIt could not be relevant for a fabulous wedding in "Alice in Wonderland" style. 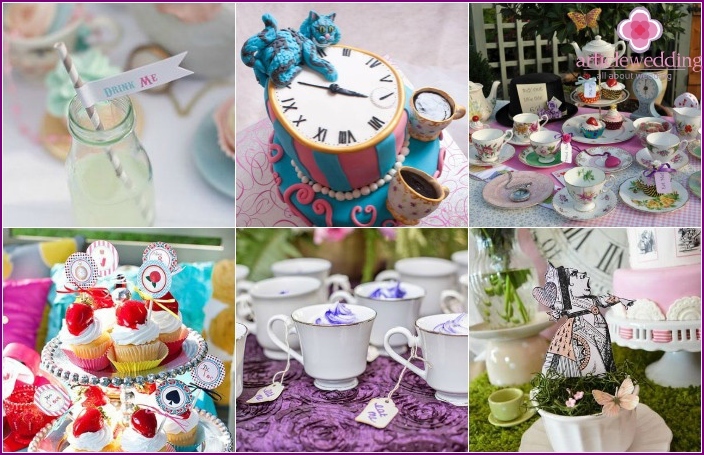 Newlyweds can arrange a real "mad tea party", making out the bar accordingly. Crockery different sizes and colors with a sign "Drink me", playing cards, hats, character figurines will be a great decoration for a tea corner. The more vivid colors, the more effective will look like a table. Newlyweds can additionally arrange desserts decorate their notes "Eat me" book themed cake. Tea is associated not only with England, where hisdrink in large quantities, but also with China, Japan and other eastern countries. Newlyweds can arrange for guests tea ceremony, especially it will be appropriate to the theme of Chinese wedding. In Moscow it easy to find professionals who hold a beautiful event the audience, will treat all the delicious varieties of green, white, black teas, talk about the ancient traditions and culture of the eastern tea. Guests will learn many new things, it will allow them to better feel the festive atmosphere. Even more interesting can get tea barat an event in the Indian style, because in India formed a special recipe of preparation of the drink. 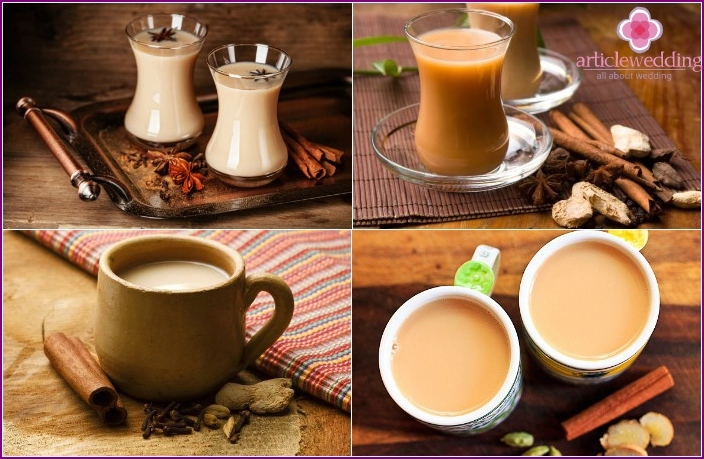 The most popular there is a masala tea, which is prepared in milk with different spices - cinnamon, nutmeg, pepper, cardamom, cloves. Enormous role played by Ginger. Several species of this unique beverage will be a wonderful decoration of the table for tea parties. Masala has a specific taste, so it can not please all the guests - Diversify this bar is more usual teas. Russian tea tradition formedaristocrats, with time quickly dispersed throughout the country and become national property. 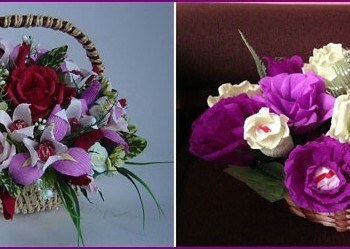 Making Russian themed wedding, the newlyweds can enjoy the ancient customs. For example, before it was decided to drink tea from cup holders: The drink brewed in a huge kettle was very strong, so small a part of the welding poured into glasses, and diluted with boiling water from the samovar, he often drank from the saucer. In the gentry it was made to drink tea with dryers, jam, honey, pies. Russian tea bar future spouses can decoratetraditional cloths, handkerchiefs with red-black-gold patterns, instead of glasses can use the service of the respective colors and shades. The board should be put treats: cakes, drying, candy, several kinds of cakes and teas can be brewed in large kettles. Complete the decor of the bar a large golden samovar. On rustic weddings tea bar looksorganically. Translated from the French "rustic" means "village", this subject involves a certain style and decor of the bar filling. Newlyweds instead of fine black and green teas may prefer herbal, fruity beverage options, to place on the table all sorts of additives to welding. As an approach treats homemade jams, honey, biscuits, cakes. To tea is best to choose the old, frayed or sets glass cups, as a tablecloth suitable piece of linen cloth. The English are known for their love of tea drinking -evening ritual between four and five o'clock rarely misses. 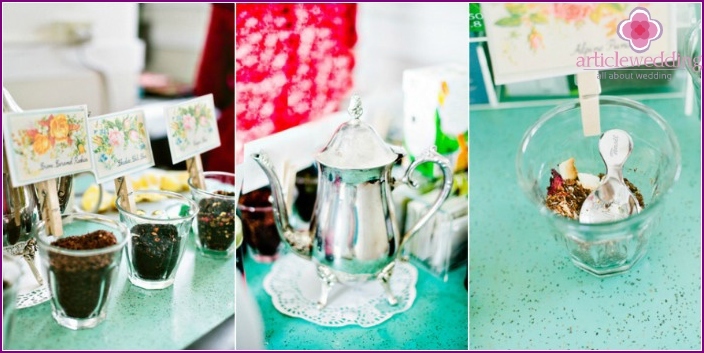 By organizing a tea bar in the English style, you need to choose a beautiful elegant set with teapot, be sure to put on the table jar with milk. Tea cozy corner to fit exclusively sheet. 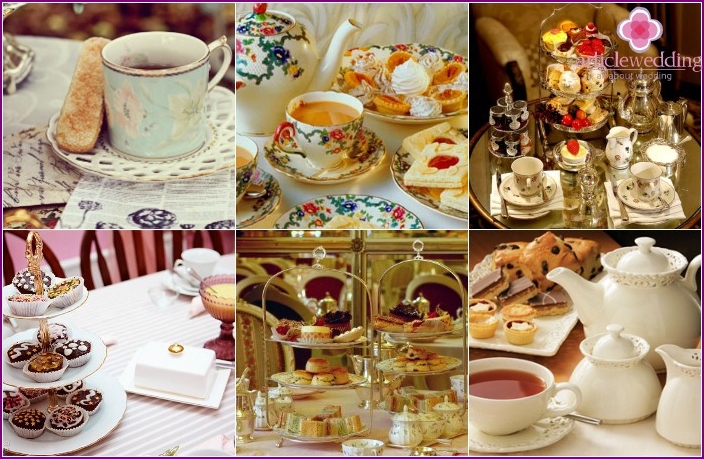 English tea party can do without all kinds of snacks - sandwiches, cake pieces, cakes and sweets. 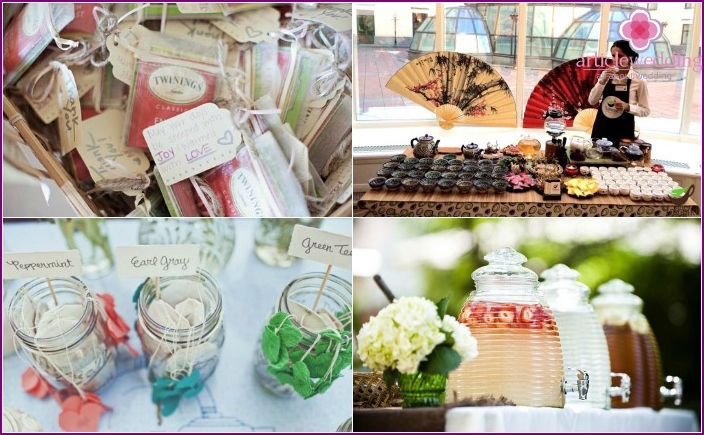 How to organize a tea bar at the wedding? The tea bar is easy to organize: it needs to be defined with the style, and then proceed to the preparation. Ideal to put on the table 4-5 kinds of teas (eg, two green, and two black fruit), should be expanded in separate jars for beverage additives - mint, berries, thyme, rose petals, daisies and other plants. All elements must sign. 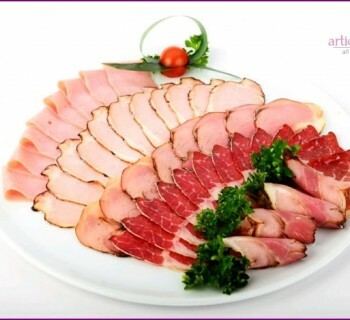 Complement is a bar and sweets, which will choose married - cookies, pies, cakes, sweets, and sugar you need to prepare tea. As the candy boxes newlyweds can give guests a tea bags with dessert spoon. 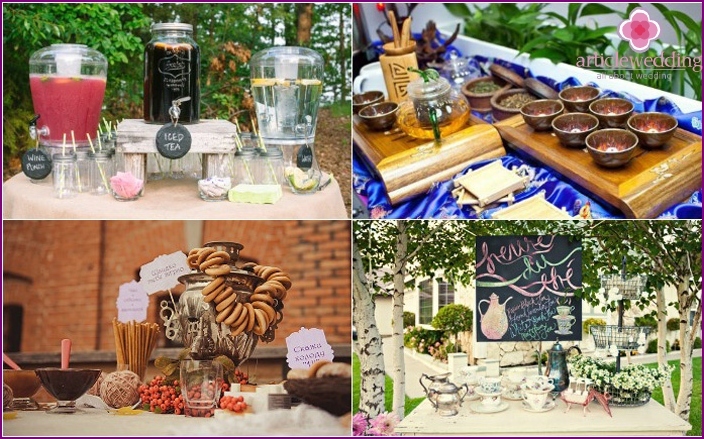 There are several design options of the teabar for a wedding celebration. To select a suitable, married couples need to study the idea, already implemented by other couples. Selection of photos with a variety of tea tables will help future spouses to come up with an original visual style that will make wedding decoration and decor event unforgettable.